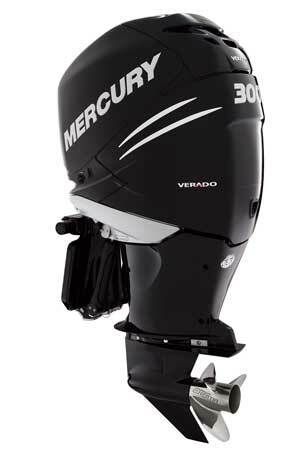 More power and performance from Mercury Racing, a new Mercury diesel, and new advanced vessel controls are all coming in 2017. 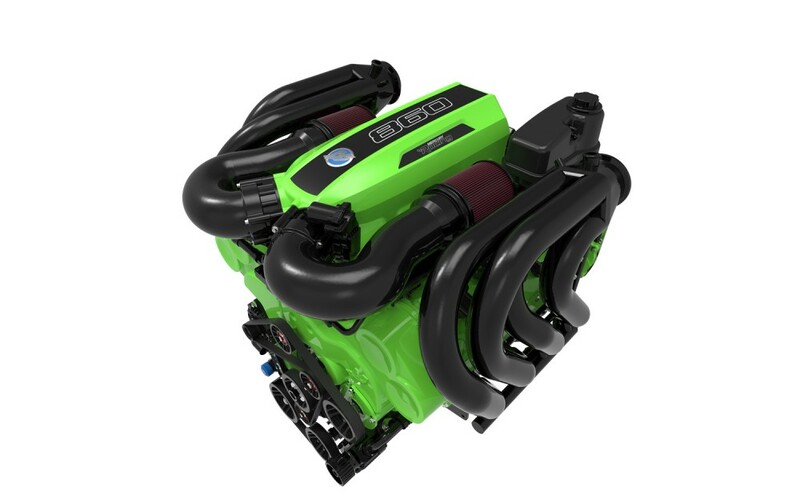 This new naturally aspirated, 9.0-liter V8 engine features Mercury Racing’s exclusive aluminum four-valve cylinder heads and dual overhead camshaft valve train. Mercury says this valve train greatly enhances engine performance and durability over a standard two-valve design, and enables the engine to produce 860 HP at 6,800 rpm on 89 octane (Rec 90) pump fuel. 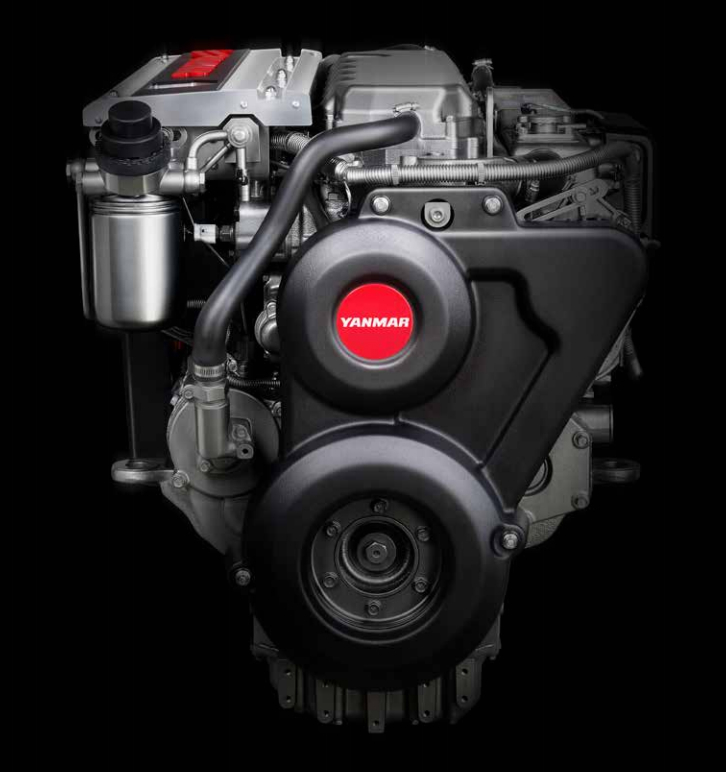 The engine’s 6,300-6,800 rpm operating range offers strong acceleration for its power rating and expands the range of propeller options available for a variety of applications. An all-new hydraulic transmission designed specifically for the 860 is engineered to handle high torque and power levels. The 860 comes standard with the legendary Mercury Racing M6 surface drive. The higher-capacity M8 sterndrive is optional. The new racing engine produces an astounding 1,750 HP and 2,000 ft. lbs. 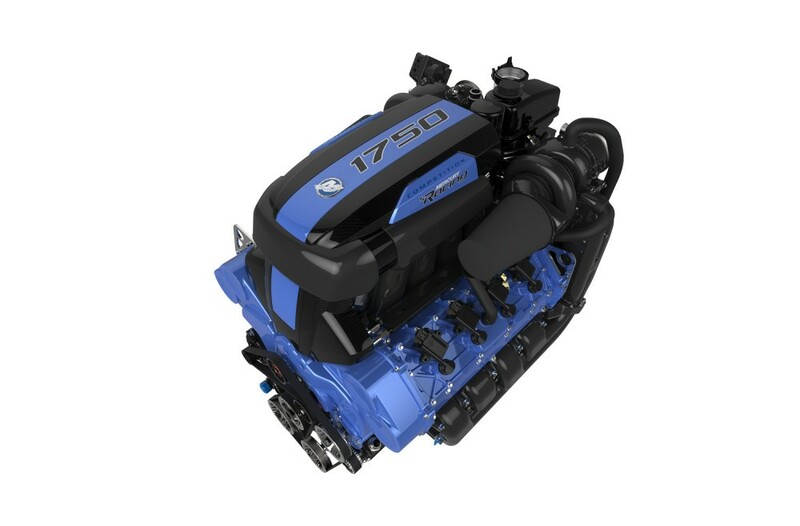 peak torque, and is the most powerful engine ever produced by Mercury Racing. An update of the race-proven Racing 9.0-liter V8 with aluminum four-valve cylinder heads and dual overhead camshaft valve train, this engine features new turbochargers with a larger compressor wheel to provide greater airflow for enhanced power and torque, and an all-new heat exchanger in the closed cooling system to maintain engine temperatures for enhanced durability. 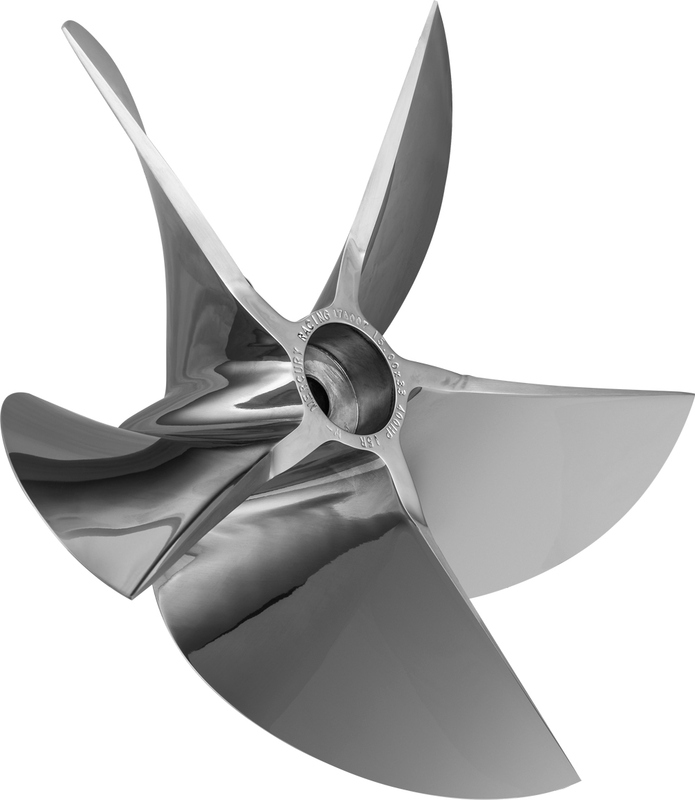 Designed exclusively for 400R consumer performance outboards and the 400 ROS competition outboard, this precision machined five-blade propeller is designed to maximize top-end speed on performance hulls powered by 400R and 400 ROS outboards fitted with the Mercury Racing Sport Master gearcase. The prop offers a 400 HP rating. Models range from 14.5-inch to 15.5-inch diameters, with 15-degree rake and the following pitches: 32, 32.5, 33.5, and 34. 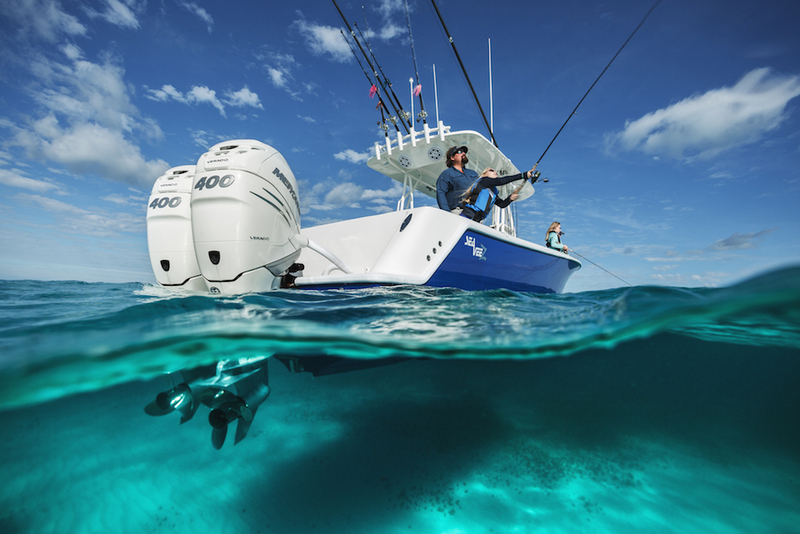 Each carries a one-year limited warranty when used within its maximum power rating on a 400R or 400R Carbon Edition outboard for recreational boating. 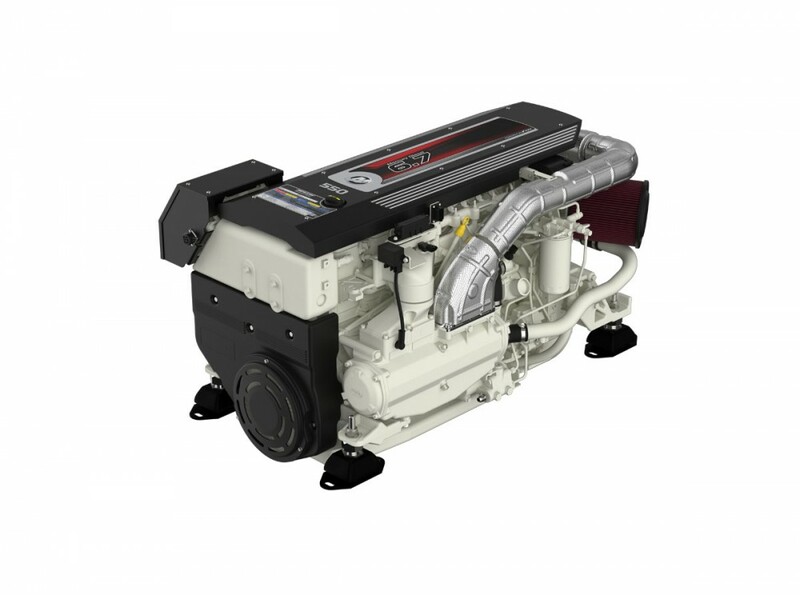 The new Mercury Diesel 6.7L engines are electronic, common-rail engines offered with three power levels: 480 HP, 500 HP, and 550 HP, available as inboards or packaged with the Mercury Zeus pod-drive. The engines are assembled by the Italian firm FPT Industrial at its dedicated marine engine plant. 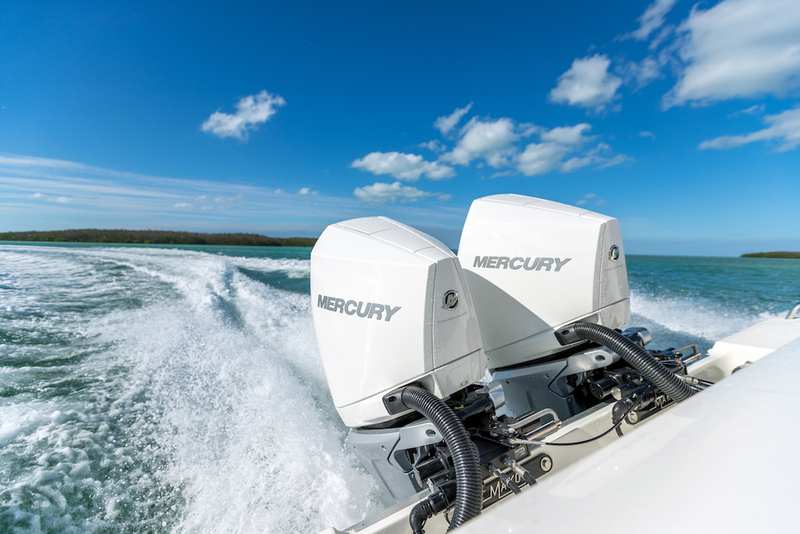 The new Mercury Diesel engine is compatible with Mercury’s full suite of SmartCraft controls and electronics, including optional joystick piloting for inboards and joystick piloting for Zeus pods. 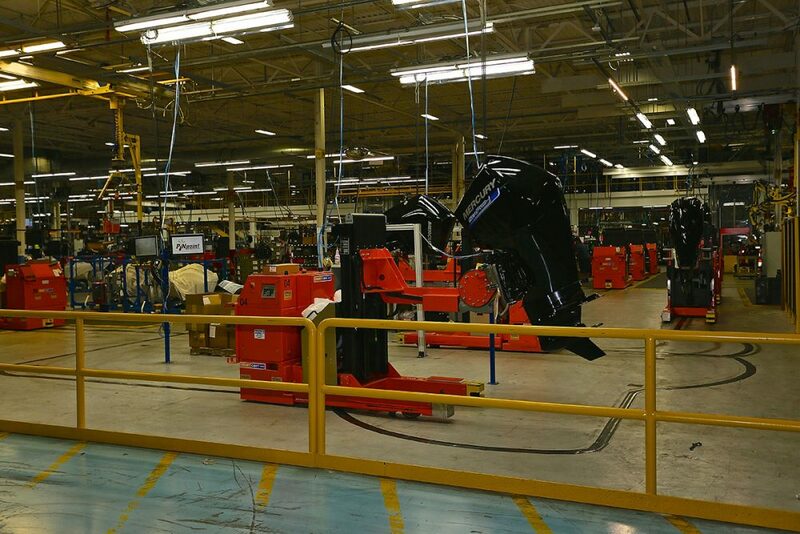 Mercury says the state-of-the art engine control system and electronic common-rail fuel injection technology provides low fuel consumption resulting in affordable operating costs and extended range. The engines carry carries EPA Tier 3, RCD 2, and IMO Tier 2 emissions certification. 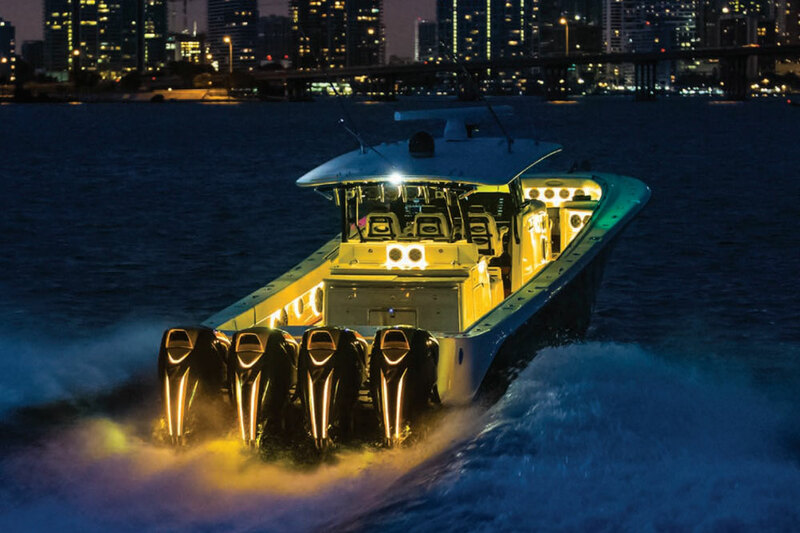 The next-generation VesselView multifunction display incorporates the new Simrad SolarMAX HD display and provides increased clarity, high-definition resolution, wide viewing angles, and enhanced controls for easier operation in all conditions. The bright, high-definition glass touchscreen display has a 16 x 9 aspect ratio for higher visibility, glare-reducing coating, and dimmable lighting. The hybrid touchscreen and button interface allows users to choose the display interaction they prefer depending on sea state and weather conditions. 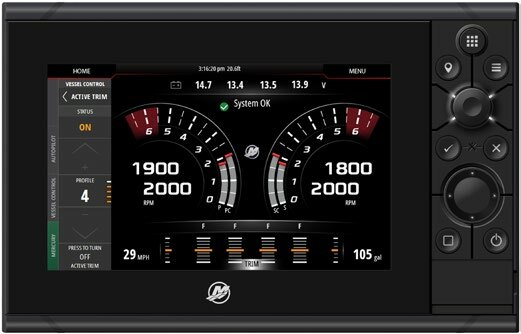 VesselView 703 simultaneously displays information for up to four engines in an easy-to-read interface. The display provides up-to-date information for more than 30 parameters. VesselView 703 also has an integrated echosounder and true dual-channel CHIRP. It also can be integrated with all the Simrad accessories for the NSS Evo3 product line, including radar, sonar transducers, fishfinder transducers, AIS, VHF, Sonic Hub/Fusion Link, C-Zone digital switching, and more. A highly expandable system, VesselView 703 has the gateway functionality to allow SmartCraft data to be displayed on NMEA 2000 devices. It supports 16 languages and multiple unit conversions, and also features automatic notification of available software updates through GoFree Wi-Fi, which is integrated into the system. An enhancement for Mercury Joystick-equipped vessels, Skyhook Advanced Features is designed for convenient purchase as downloadable content (DLC) from Mercury’s GoFree store, and provides Joystick vessels with new positioning control options. Heading Adjust provides Joystick operators with the ability to adjust the heading lock in 1- and 10-degree increments while SkyHook is active, making vessel control even more precise. 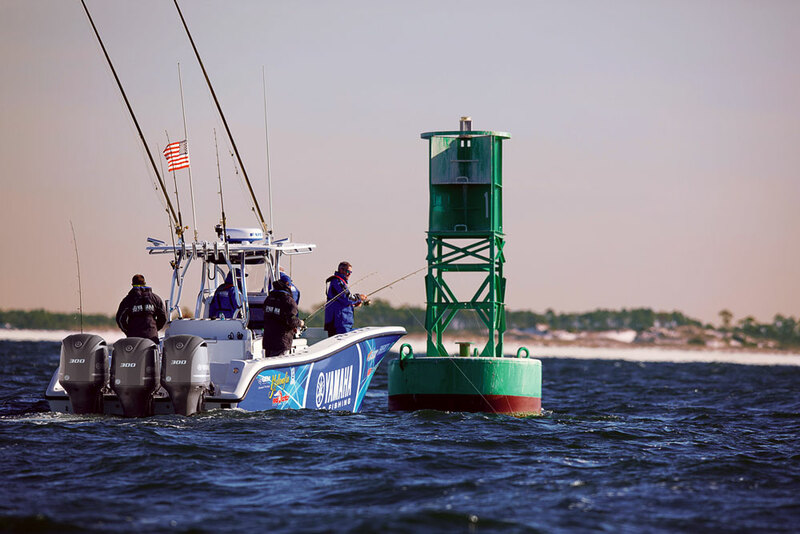 BowHook can be used to unlock heading and just maintain position, allowing the boat to point in whatever direction the winds and currents dictate. This feature is useful when a locked-in heading is not necessary. DriftHook lets the operator maintain heading and unlock the position of the vessel, allowing winds and currents to move the vessel along. Adjustments of 1- and 10-degree increments can be made while drifting when bundled with Heading Adjust. Skyhook Advanced Features will be available in late May, 2017. These features require Mercury’s latest Joystick system and initially, VesselView703 (also available in late May). Boaters will be able to purchase Skyhook Advance Features for VesselView502, VesselView702, and compatible Lowrance and Simrad displays after a software update in late 2017.